Thread: Happy Birthday reneed !!! Know what would look good with you????? Wow. Is Renee's birthday on the 25th, or on today the 26th?? If it is today, the 26th, then Renee and I have the same birthday. That's crazy...........................in a good way! Happy Birthday Purdee Wilson. Hope they finally quit carding you when you buy beer, it must be awful to look so young. Happy b-day Derek and Renee! Happy Birthday to one great big sista!!! Happy B Day reneed! Hope it's a good one! Happy Birthday Renee!! Glad to see your day is a National Holiday thanks for the day off!! Yep, it's fitting that you were born on a national holiday! You got blonde roots ? Happy Blue Sky Birthday Renee. No, but I have enough blonde moments to make it official! All right! Happy Birthday Reneed! Enjoy! Happy burthday you sweeet thang!!!! Got my happy birthday hug from you yesterday, but here's another birthday wish heaped on top of all the other GB birthday wishes. Glad you decided to take today off. It just ain't right to work on your birthday. A birthday is a holiday, right? 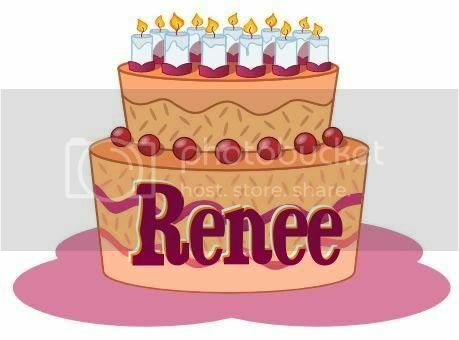 A super big Happy Birthday wish to you Renee..! Happy be-lated birthday wishes to Reened. I be-late because I didn't read this sooner. Have a good day, chillin' out with Ms. Thang and all that. I hope it's rootin-tootin, dang goodun! Happy Birthday Renee. Great spending some quality time with you yesterday at the music fest....er, I mean wedding... now that was some wedding wasn't it! a very happy b-day to you miss renee. Happy birthday from a fellow Gemini enjoy your day!!!!!! Renee, are you legal yet???? YO,,, HAPPY B'DAY! Let the Par-tay begin. Happy Birthday sweetie! May you have a wonderful day!! I baked you something darlin.You can share it with you know who. Happy Birthday Sugar......and many more!! Damn, I'm late for everything. Happy Bithday Reneed. Always like to follow your comments on here, hope we meet up someday.Enjoy! Belated, but heart-felt.....hope it was a great day, Renee! Happy Birthday, Renee! Glad to hear that you (and Miss Thang ) enjoyed your day - have a great year!